Researchers know that the absence of a normal protein leads to Fragile X syndrome, the most prevalent inherited form of intellectual disability. But the exact mechanisms by which the loss of this protein causes the symptoms of Fragile X syndrome are unknown. The Eunice Kennedy Shriver National Institute of Child Health and Human Development, an arm of the National Institutes of Health (NIH) that includes Fragile X research as a priority, awarded a grant of more than $394,000 to Dr. Rita Mihailescu, associate professor in the chemistry and biochemistry department. Mihailescu and her team have been working to untangle the mechanism of the mysterious Fragile X Mental Retardation Protein (FMRP) for about nine years, striving to understand exactly how the protein exerts its regulator function. With this three-year grant, Mihailescu and her seven student assistants will focus on applying biophysical methods to elucidate how the protein works. "We are asked, 'Why study a protein that isn't there?' The reason is to find anything that will mimic the function of this protein, you need to understand how this protein works," Mihailescu explained. Fragile X syndrome impacts one in 4,000 males and one in about 7,000 females, according to the NIH. Males not only bear a greater prevalence of Fragile X syndrome, they often face more severe mental impairment than females. One in four males with Fragile X also are autistic, compared with about 7 percent of the females with Fragile X. So those with Fragile X syndrome—and their families—face lifelong journeys of coping with the impacts of this genetic misfiring, and various forms of the disorder can be carried for generations. "Multiple conditions are associated with Fragile X," Mihailescu said. "The key mechanism and cornerstone for interventions is the missing protein." Mihailescu will collaborate with Dr. Gary Bassell, a cell biologist at Emory University, whose work with live neurons complements her research. The collaboration brings together two teams with different expertise working toward a common goal: to contribute to our understanding of how FMRP exerts its function in the cell. A consideration in this NIH funding is not only the increase in scientific knowledge but also the opportunity to develop and train student research assistants. Mihailescu will teach techniques used across molecular biology, biochemistry and biophysics. Building skills, working on a lab project involving different scientific methods and accessing research-quality equipment all are crucial to producing a new generation of scientists. "Our detailed understanding of the molecular basis for diseases is critically dependent upon securing detailed knowledge of how healthy living systems function cells," said Dr. David Seybert, dean of the Bayer School of Natural and Environmental Sciences. "Dr. Mihailescu's superb work is establishing the scientific foundation that future clinical researchers will require in effectively addressing therapies and treatments for these devastating disabilities." 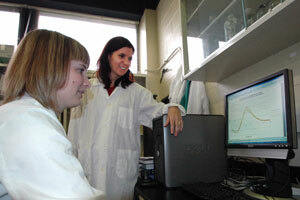 To learn more about Mihailescu's research, watch Duquesne's Fragile X video.